Prisoners and their families hoping for pardons may be the people who are most excited by the announcements of 2016 presidential candidacies — it’s a reminder that the time remaining in Obama’s term is shrinking, and that their hopes for an end-of-term pardon are rising. President Obama more than doubled the number of commutations he’s granted during his tenure on Tuesday, when he shortened the sentences of 22 nonviolent drug offenders. But, as I wrote yesterday, he has still granted commutations and pardons at a lower overall rate than most other recent presidents, partially due to the explosion of commutation requests after the Department of Justice expanded eligibility guidelines. This isn’t that surprising. By the end of their lame-duck term, a president’s legislative clout has typically diminished, so clemency and other executive powers become more important tools for wielding influence. The closer presidents are to the end of their terms, the less costly it is to use these powers, since they will not face the voters again. In addition to backloading pardons generally, presidents often delay their most controversial pardons until the very end of their last term, as Bill Clinton did when he pardoned Marc Rich. 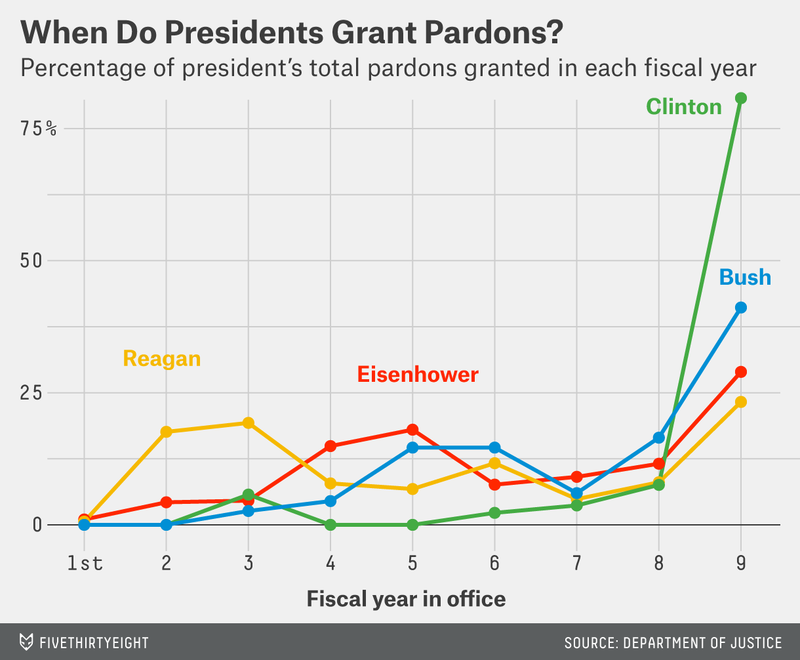 Because presidents have granted far fewer commutations than pardons, this data is much noisier and prone to arbitrary spikes. For example, George W. Bush appears to have a dramatic end-of-term spike, but this is primarily an artifact of how few commutations he granted in total (11). Otherwise, there’s a lot of variation. Ronald Reagan didn’t commute any sentences during his last few years in office. Clinton commuted a ton. So it’s hard to say what the pattern is with commutations. But if his predecessors are any guide, Obama is likely to grant clemency at a higher rate as the next election approaches, but the size of the spike will be determined more by the president’s priorities than historical trends. The Department of Justice tracks pardons and commutations by fiscal year, so the first and last points in the series do not cover a full fiscal year. 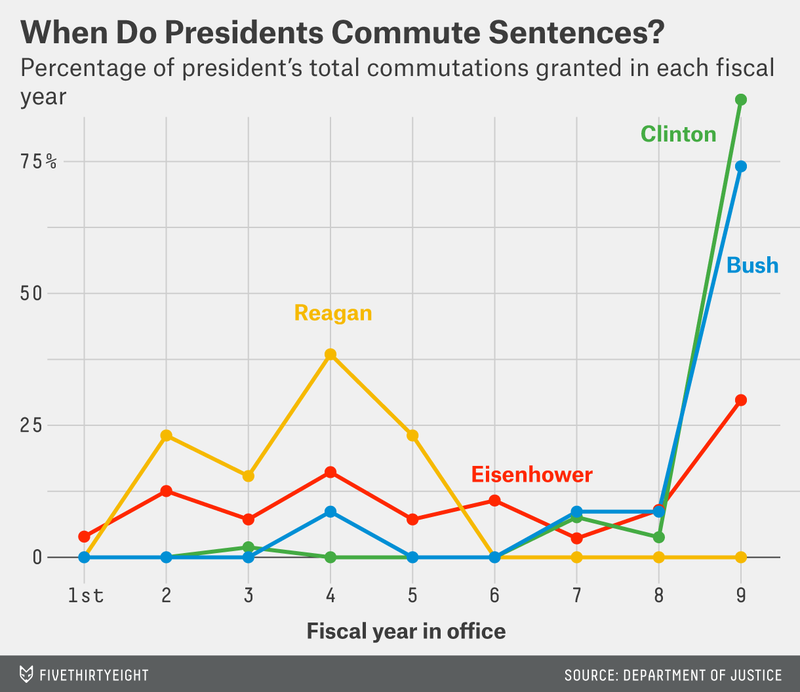 Pardons and commutations were normalized by the number of months the president served in each fiscal year.